Director: Neal Sundstrom / Writers: Stephen Ronald Francis & Gus Silber / Cast: Steve Railsback, James O’Shea, Zuleikha Robinson, Nick Boraine, Craig Kirkwood, David Dukas, Nina Wassung, Neels Claser, Brett Goldin, Danny Keogh. I’m being made to watch a Twilight film. Approximately 10 minutes in and the sonically boring essence of it all is making me want to throw myself into a woodchipper, so here’s a rundown of sub-par (but still about 227% better than Twilight) South African American-pretender Slash. A rock band, who conveniently share their name with the film, are looking for a break. When the lead singer’s aunt dies, he is invited back to the farm he grew up on for her funeral. So happens that his grandpa, Jethro, was a notorious serial killer who scythed dozens of locals and donated their blood to the harvest in the belief it would improve their farming luck. So it comes as little surprise that the band become stranded at the darm when their bus ‘breaks down’ and a scarecrow-costumed psycho starts picking off the group with a large sickle. The identity of the killer is revealed, although in fairness there are only three suspects, and opens itself to much scrutiny concerning to obtuse plotting. 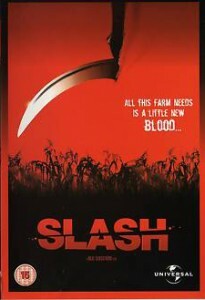 Not that Slash is a bad film, it’s just flawed enough that is blocks any chance of becoming a better film. Some witty one-liners and a strangely upbeat climax, which sees too many of the band members survive, push the standard expectations aside, which make it seems as though the ending might’ve been re-shot a couple of times to the audience’s preference. Twilight is still on… Someone mail me a woodchipper.